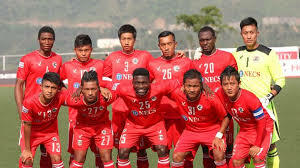 Mizoram’s Aizawl FC are in a strong position to win the I-League. Bagan, who won the I-league in the 2014-15 season under coach Sanjoy Sen, are top of the table with 33 points after 16 matches. Aizawl have the same number of points as Mohun Bagan but are second owing to an inferior head-to-head record. Aizawl are scripting their very own Leicester City tale. The club were relegated last season, but reinstated to the I-league to expand the existing league to ten franchises as the Goan contingent dropped out. They are the strongest team ever to come out of the India’s Northeast. Royal Wahingdoh finished third in the 2014-15 season. The permutations are simple: a Bagan victory will grant the Bengal club the title. Aizawl need to win by a two-goal margin to seal the title. A draw would see both teams’ fate being decided in the last round of matches when Mohun Bagan host Chennai City FC and Aizawl travel to Shillong Lajong.